Special Containment Procedures: SCP-241 is to be kept at Site-19 using standard operating procedures for containing Safe-class book- and manuscript-type SCPs (see Document 241-05-3H), with the following additional conditions: SCP-241 must be kept open on a flat surface, with restraints across opposing pages of the open book to keep it from closing accidentally. Containment devices must be checked at least once a week for structural integrity. Any anomalies must be reported immediately to Site Command. Access to SCP-241 is restricted. Any and all usage of SCP-241 must be logged. SCP-241 must be transported in an authorized bookstand such that it cannot accidentally be closed in transit. In the event that SCP-241 is opened outside of a testing environment, the last person to have touched it must report to the nearest infirmary, and a D-class personnel must close and re-open SCP-241. Description: SCP-241 appears as a normal book, 33 cm x 23 cm x 3.5 cm, entitled Good Home Cooking. The cover of SCP-241 is a red and white checkerboard pattern, with the title in simple black letters on the front and spine. When open, SCP-241 contains 99 recipes, sorted into typical sections of a cookbook. Many of these recipes include a picture of the dish that is invariably appetizing, and a small percentage will call for rare or exotic ingredients. Whenever SCP-241 is opened by a subject (known as the Target) different from the one who last opened it (i.e. 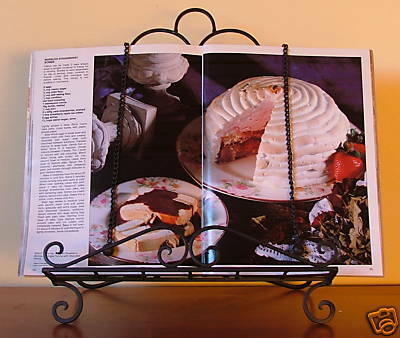 the previous Target), the recipes contained in the book change. Preliminary investigations concluded that if the Target eats a dish prepared from one of the recipes in SCP-241, that person soon dies from apparent anaphylactic shock. Others who eat the same dish are not similarly affected. Testing has been authorized to determine the exact nature of SCP-241’s effects. SCP-241 appears to be impervious to getting dirty and to at least minor damage. For example, sauces splashed onto its pages disappear almost immediately, and torn pages and nicks on the cover are repaired within seconds. Testing on the limits of SCP-241’s durability are not authorized without approval from [DATA EXPUNGED] and [DATA EXPUNGED]. Research on SCP-241 continues, including potential interaction with other SCP items. For more information on current experimentation, please see the Supplemental Testing Log. In light of recent test results with SCP-241, no further testing of SCP-241 on personnel without pre-existing food allergies is authorized without Level 4 Security Clearance. Testing may continue on personnel with pre-existing food allergies as long as documentation of said allergies has been filed with [DATA EXPUNGED]. –O5-██. Reclassification of SCP-241 to Euclid class is denied. Honestly, the cookbook? Leave it in its room and everything’s fine. It’s no one else’s fault if you don’t know what you’re allergic to and don't bother to find out beforehand. Unless you’re cooking for your significant other, then you’d better know. –O5-██. Cross-testing SCP-241 with other SCPs will be considered on a case-by-case basis. Exposure to SCP-682 has already been considered and denied. –O5-██. The Foundation became aware of SCP-241 in April 20██, while investigating reports of a “black widow” in ██████, ██, named ████████ █████████. Mrs. █████████ had been married four times, and all four of her husbands had died shortly after eating a meal at home. However, since authorities never found evidence of foul play, Mrs. █████████ was never charged with any crime. Subsequent interviews with Mrs. █████████ by Foundation personnel revealed the existence of SCP-241, at which time SCP-241 was seized by Foundation agents. Mrs. █████████ revealed that she had first realized there was something unusual with SCP-241 when [DATA EXPUNGED]. See document [DATA EXPUNGED] for transcripts of interviews with Mrs. █████████. All tests on SCP-241 were carried out in Test Kitchens at Site-19, using D-class personnel for test subjects, unless otherwise indicated. Subject: Subject 241-A was chosen from general population. No unusual traits selected for. Procedure: Subject 241-A was presented SCP-241 while closed and instructed to open it, choose a recipe, prepare it, and eat it, while giving feedback during the entire process. Three minutes after completing the meal, subject started showing symptoms of anaphylactic shock. Subject was treated with emergency doses of epinephrine, but treatment was not effective. Subject died from anaphylactic shock six minutes afterward (later confirmed by autopsy). A subsequent examination of SCP-241 revealed that 81 of its recipes called for shellfish. SCP-241 was left open. Analysis: Results are consistent with previous descriptions of the effects of SCP-241. Subject: Subject 241-B was chosen from general population. Subject reports no known allergies to scallops or other shellfish. Procedure: SCP-241 was still open from Test 241-01. Subject 241-B was instructed to not close SCP-241, find the Sautéed Scallops recipe, prepare it, and eat it, while giving feedback during the entire process. Results: Before exposure to SCP-241, subject expressed doubt that he’d be able to prepare the Sautéed Scallops recipe. After preparing the dish, subject expressed surprise that he had done so, similarly to the reaction of Subject 241-A, and said that the dish smells “pretty good”. While eating, subject declared that the dish was “pretty good” and again expressed surprise that he had cooked it. Subject did not suffer anaphylactic shock or any other adverse effect after completing the meal. Post-testing observation of subject revealed no long-term effects from eating the dish. SCP-241 was left open. Analysis: Results are consistent with previous descriptions of the effects of SCP-241. Suspect that SCP-241 may somehow improve the cooking skill of whoever is preparing the dish. Subject: Subjects 241-C and 241-D were chosen from general population. Both subjects report no skill in cooking and no allergies to shellfish. Procedure: SCP-241 was still open from Test 241-02. Subject 241-C was instructed to not close SCP-241, find the Sautéed Scallops recipe, and transcribe it to a standard sheet of paper. In a separate test kitchen, Subject 241-D was given the transcribed recipe and instructed to prepare and eat the dish prepared. Results: Subject 241-C found and transcribed the recipe without incident. The transcribed recipe was visually compared to the recipe in SCP-241 and confirmed to be identical. SCP-241 was left open. Subject displayed no adverse effects from interaction with SCP-241. Subject 241-D was given the transcribed recipe and attempted to prepare the Sautéed Scallops, but experienced difficulty and frustration, several times declaring, “I told you guys I can’t cook!” The completed dish did not look or smell nearly as good as in previous tests. Subject balked at eating the dish, saying that “it smells like ████,” but was persuaded to eat it by [DATA EXPUNGED]. Subject ate approximately 40% of the meal before stating, “I’m gonna be sick,” at which time subject vomited. Subject was instructed to finish the meal, but subject responded [DATA EXPUNGED]. Termination of subject considered but rejected in favor of further testing. Analysis: More evidence that SCP-241 can improve the cooking skill of its user. Subject 241-D retained for further testing. Procedure: SCP-241 was still open from Test 241-03. Subject 241-D was instructed to not close SCP-241, find the Sautéed Scallops recipe, prepare it, and eat it, while giving feedback during the entire process. Results: Subject vociferously protested to having to eat her own cooking, but was persuaded to cooperate with the promise that subject would not have to eat the resultant dish if it turned out like in the previous test. Subject expressed skepticism but proceeded to prepare the Sautéed Scallops recipe. While cooking the dish, subject experienced none of the difficulties she experienced from the previous test, instead expressing the now-familiar surprise that her cooking was turning out so well. The completed dish looked and smelled similar to the results of Test 241-02. Subject was not nearly as reluctant to eat the prepared dish, declaring it “not bad… not bad at all.” Subject did not appear to suffer from any adverse effects after eating the dish. During post-testing interviews, subject was asked how she was able to prepare the Sautéed Scallops during this test when the results of the previous test were so unappetizing. Subject stated that she did not know, only that once she started cooking the dish, it became perfectly clear to her how to do it. Subject did not appear to have any additional knowledge of cooking, and even had trouble remembering the cooking techniques she used in this test. Analysis: There is now little doubt that SCP-241 can turn people who know nothing about cooking into gourmet chefs, at least for the dish that’s being prepared. Subject: Subjects 241-E and 241-F were chosen from general population. Subject 241-E is known to have an allergy to peanuts. Subject 241-F has demonstrated considerable skill as a chef. Procedure: Subject 241-E was presented SCP-241 while closed and instructed to open it and choose a recipe. Subject 241-F was then instructed to prepare the selected meal from SCP-241. The prepared dish was given to Subject 241-E, who was then asked to eat it. Results: Subject 241-E opened SCP-241 and, while looking through the recipes offered, stated that all the recipes called for peanuts, adding, “peanuts mess me up something fierce.” Subject found a few recipes that did not include peanuts, and selected an Australian Carrot Cake. Subject 241-F prepared the Carrot Cake from SCP-241 and remarked that the finished product was better than he expected. The cake was presented to Subject 241-E, who started eating without prompting or hesitation. Subject stated that the cake was “the best thing I’ve ever eaten” and ate nearly half the cake before claiming satiation. Within two minutes, subject started showing symptoms of anaphylactic shock. Subject was administered epinephrine, which was ineffective, and died four minutes later (autopsy confirmed anaphylactic shock as the cause of death). The recipes in SCP-241 were examined, and 85 of the 99 recipes called for peanuts or peanut products, but the Australian Carrot Cake was not one of them. The Carrot Cake and seven other recipes included lupin flour; a quick search found that lupin flour can induce an anaphylactic reaction in those who suffer from peanut allergies. The remaining six recipes called for more exotic ingredients: two called for [DATA EXPUNGED], and while the other four asked for [DATA EXPUNGED], respectively. SCP-241 remained open. The remaining half of the cake was saved for further testing. Analysis: Reactions of Subjects 241-E and 241-F were both consistent with prior observations. The selection of recipes supports the theory that SCP-241 somehow determines the substance that the Target is most allergic to, and offers recipes to specifically induce a fatal allergic reaction in the Target. Contacted [DATA EXPUNGED] for analysis of the six “exotic” recipes. Procedure: Subject 241-F was instructed to prepare the six dishes that contain neither peanuts nor lupin flour. The dishes were turned over to [DATA EXPUNGED] for analysis. The six recipes were transcribed and turned over to [DATA EXPUNGED]. Subject 241-F showed no apparent ill effects from preparing seven different dishes from SCP-241 in quick succession. Recommend retaining subject to study long-term effects of secondary (i.e. not as the Target) exposure to SCP-241. Subject: Subject 241-G was chosen from general population and is known to have an allergy to peanuts. Procedure: Subject was instructed to eat the remaining cake from Test 241-11. Results: Subject asked if the cake contained peanuts, and was assured that it did not. Subject stated that he didn’t much like carrot cake, and was told [DATA EXPUNGED]. Subject started eating the cake, remarking that the cake was “pretty good, actually”. Subject consumed approximately 75% of the remaining cake before declaring satiation. After seven minutes, subject started showing signs of anaphylactic shock. Epinephrine was administered, and subject was stabilized. Subject eventually recovered, although recovery time was somewhat longer than expected. Analysis: It appears that, although the recipes from SCP-241 are potentially hazardous to anyone susceptible to the allergen in question, SCP-241’s recipes are most potent against the Target. Results from Tests 241-12 and 241-13 are encouraging to [DATA EXPUNGED] for [DATA EXPUNGED]. Subject: Subject 241-H was chosen from general population. According to complete health screenings, subject has no food allergies. Procedure: Subject was instructed to open SCP-241 and leave it open for analysis. Results: Analysis of SCP-241 showed that 79 of the recipes on its pages called for chicken eggs or egg-based products. 15 of the remaining recipes called for eggs from [DATA EXPUNGED]. The other five recipes [DATA EXPUNGED]. These five recipes were transcribed by [DATA EXPUNGED] and turned over to [DATA EXPUNGED]. Subject 241-H stated that she had never experienced any problems eating eggs before. Subject was presented with one dozen hard-boiled chicken eggs and was instructed to eat them. Subject asked for salt and pepper (granted), and proceeded to eat the eggs. While eating the third egg, subject started complaining of stomach pain. Subject was instructed to continue eating, and she begrudgingly continued. Upon ingesting her seventh egg, subject collapsed on the floor, doubled over in pain. Within 60 seconds, subject started showing signs of anaphylactic shock. Epinephrine was administered, and subject was stabilized. Subject recovered, within the expected recovery time for such an episode. Analysis: We now have evidence that SCP-241 somehow induces or amplifies an allergy in the Target when SCP-241 is opened. This ability would explain how SCP-241 is able to cause an allergic reaction in Targets without pre-existing food allergies. For information about subsequent and current experimentation, see the Supplemental Testing Log. To determine the effects of SCP-241's recipes on subjects that either cannot eat or do not require sustenance, approval was given to crosstest SCP-241 on SCP-1770. Upon subject opening the book, the contents were identical to before it was closed previously. This confirms results of Test 241-23 in which SCP-241 does not respond to inorganic subjects.